These were the words with which Swami decorated Col. Joga Rao after presenting him ceremonial kankanams (gold bracelets) and a silver salver, in front of the vast concourse of devotees assembled in the Hill View stadium to celebrate Bhagavan’s 65th Birthday celebrations. Some people live with such courage, verve and an endearing joy of life that it is an inspiration to all around them. Colonel S.P. Joga Rao was one such person. His high-spirited personality and openhanded nature endeared him to everyone. His brilliance, commitment and integrity at work earned him plaudits from the mighty and the scholarly. An eminent and vastly experienced engineer, Sri Joga Rao, will best be remembered for his yeoman contribution to the development of the Prashanti Nilayam and Brindavan ashram campuses and his close involvement in several of Bhagavan’s service projects. 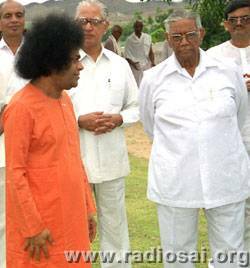 He was instrumental in the establishment of the Sri Sathya Sai Central Trust, a charitable trust under the guidance of Bhagavan, which has executed several mammoth welfare projects. S P Joga Rao enjoyed a successful tenure as Chief Engineer of Hindustan Aeronautics Ltd. (HAL), where he was responsible for much of its construction and commissioning. He also served in the armed forces where he rose to the rank of Colonel, and had been posted at many places all over India. Later he started a Civil Engineering and Consultancy Company along with a host of experts drawn from various fields of engineering, construction and management which was quite a successful venture. But, all this was just a training ground for the stupendous tasks he was to accomplish under the guidance of the ‘Architect of the Universe’. Destiny was to crown his life with a long and sweet association with the Lord come in human form. The divine call came in 1969. 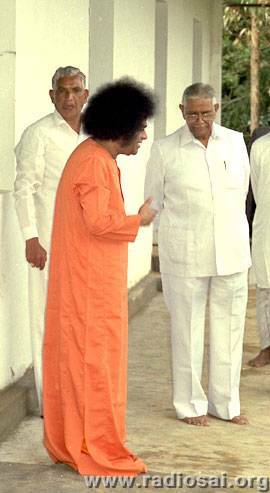 One day, Bhagavan visited the house of Sri Ramaswamy, a neighbour of Col. Joga Rao who was closely associated with service activities in Brindavan, Bhagavan’s ashram at Whitefield, Bangalore. Joga Rao, though a devotee of Lord Krishna from his childhood, had his reservations about men in ochre robes. So, although his wife and he received an invitation to Sri Ramaswamy’s house to have Darshan of Bhagavan he was reluctant to go. He had already been annoyed when a few days prior to this, he found a photo of Bhagavan Baba in the altar of his house, which his wife had received from Smt. Ramaswamy. But, his wife persisted and so he went there. Bhagavan spoke very lovingly to him and invited him to Brindavan. Baba's gentle and warm demeanour touched Joga Rao's heart and he was drawn to Brindavan soon after that. The devotional ambience of the ashram and the discipline there had a profound impact on him. Bhagavan received him very affectionately. During the conversation, He casually mentioned to Joga Rao to associate himself with the construction work of the college building at Anantapur. The passionate engineering professional in Joga Rao responded positively and that marked the beginning of a new chapter in his life. In the Nava Vida Bhakti (Nine stages of devotion) outlined in the ‘Narada Bhakti Sutra’, the stage of Sakhya Bhakti is the penultimate stage before the final merger of the individual self with the Absolute. In this stage, the devotee experiences the relationship of an intimate friend with the Lord, sporting with Him and losing oneself in the bond of love with the Lord. Sri B N Narasimha Murty in Sathyam Shivam Sundaram V says, Col. Joga Rao was privileged, to enjoy such a relationship with Swami. 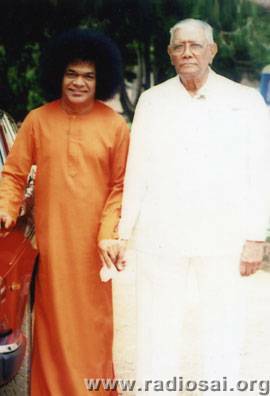 “When the document of the Sri Sathya Sai Central Trust was to be registered at Hyderabad in 1972, Bhagavan asked Joga Rao to coordinate all the related work apart from organising His visit to the city. It was obligatory that the members of the Trust be present at the time of registration. Therefore Joga Rao called up the Rajamata of Nawanagar who was at Bombay, to come to Hyderabad along with Sri Nani Palkhiwala and Sri Indulal Shah. The Rajamata conveyed to Joga Rao the same evening by telephone that she would be coming to Hyderabad with Sri Indulal Shah. She also informed him that Palkhiwala who had gone out of station would not be able to make it to Hyderabad. Since Bhagavan had had already retired by that time, Joga Rao could not convey the message to Him. That was Baba's way of playing a joke on them! Yes, of course, the Rajamata arrived at Hyderabad with Indulal Shah on time and the registration of the Trust was completed. It was this selfless service and uncompromising zeal for excellence in work that earned him the confidence of Bhagavan. With Swami’s guidance, he set about improving the amenities for devotees in Prashanti Nilayam and Brindavan. He plunged with enthusiasm into the task of planning and constructing the campuses of the Sri Sathya Sai Institute of Higher Learning at Prashanti Nilayam, Anantapur and Whitefield. 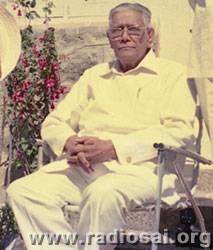 At the age of 85, when most people would rather spend their time in quietude reminiscing about the sunny days they had spent, Joga Rao dedicated himself to fulfilling the declaration Bhagavan made on the eve of His 70th birthday in His discourse on the 22nd November 1990, that in a year’s time a massive hospital would be constructed near Prasanthi Nilayam, that would bring top notch medical care to the poorest of the poor. “Yes, I have a headache; but it is a different kind of headache!” replied Joga Rao. “Can I be of any help, sir?” I persisted. That was his headache! There was nothing I could do about it, but I felt overawed by his concern and anxiety over the work that was very dear to Swami’s heart. He was working very hard to meet the deadline set by Bhagavan’s declaration about the hospital on His previous birthday. With these thoughts hovering in my mind, I lay down and slept. “Swami, You know everything,” submitted Joga Rao. “I have already received the highest honour from the Lord Himself. It would not be appropriate for me to even think of accepting any other award!" That is truly Karma Yogi Joga Rao. It was in these and many other ways that Joga Rao experienced the divine nature of Swami. The greatest fortune conferred on Joga Rao by the Lord was to be His friend and devotee when He is on earth in the human form. The wonderful relation that this engineer enjoyed with the Avatar is unsurpassed for its charming intimacy. 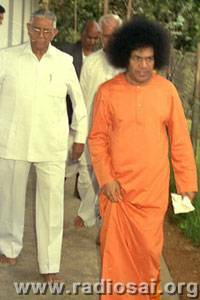 He was privileged to be witness to that astounding incident when Swami revealed His true form to a select group of devotees at Ooty, on the day of Mahasivarathri in 1978. On the previous Mahashivaratri in 1977, observing the difficulties of the mammoth crowd of devotees surging forward to have a glimpse of the Lingodbhava at Prashanti Nilayam, Bhagavan had announced that He would be cancelling further public celebration of the festival and that the devotees could celebrate the holy day in their own places from next year onwards. 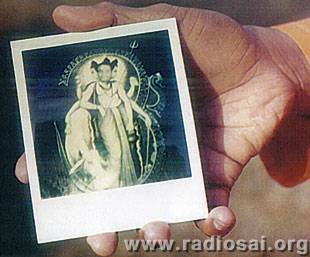 The next Mahashivaratri was on Thursday, the 7th of March 1978 . Even as devotees were wondering where He would be on that sacred day, He went away to Ooty during the early hours of the morning of 4th March with a very small contingent of students and devotees. He left Ooty on the 7th and proceeded to Mudhumalai forest, which is on the way to Mysore . He broke journey at the guesthouse on the top of a small hill in the forest. After breakfast, Baba walked on to the beautiful meadow in front of the guesthouse and posed for photographs with every member of the party. A Polaroid camera was used by a student to click the photographs. The photos were given to the members instantly. Finally, Baba asked the student to click His photograph. The lower part of His orange robe had been caught in the twigs of a bush. Before the camera clicked, Smt. 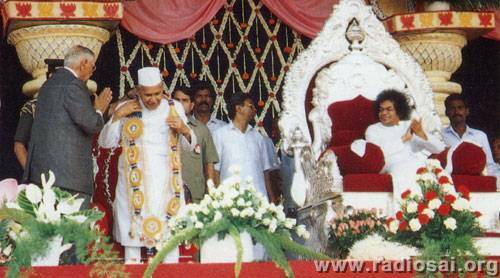 Ratanlal rushed forward to set right the folds of the robe. Everyone was astonished when Bhagavan shouted at her loudly, "Don't touch Me!" and she retreated quickly. After the camera clicked, Baba held the photo coming out of the camera and gave it to Joga Rao. As he held it in his palm, the picture developed gradually. But what did he see? In the place where he had expected to see Baba's form in orange robe, there stood a young figure in the black and white photo. The form, which wore a white flowing garment, had three heads and six hands! Each arm was holding an insignia of Divinity. The lower left arm bent at the elbow, was resting on the back of a majestic young cow. There were four dogs in the background. The face in the centre was that of Baba! It was the form of Lord Dattatreya as described in ancient Indian texts, the integrated form of the Trinity - Brahma, Vishnu and Maheshwara! That was His real form! After all eyes had feasted on that incredible creation and all hearts had registered the rare revelation, the photo vanished. Bhagavan confirmed while speaking to the students at Brindavan the next morning that it was indeed His true form. He also clarified that Smt. Ratanlal would not have survived if she had touched Him then! Another instance, when Bhagavan revealed His Omniscience and Omnipotence to Joga Rao was recounted to us by Dr. A. Sudhir Bhaskar, professor in the School of Business Management, Accounting and Finance at Bhagavan’s University. Joga Rao was returning to Prashanti Nilayam after visiting some officials at Anantapur. But, even as they were hurrying back, they were caught in a heavy downpour. But, Joga Rao was eager to apprise Swami of all that had transpired and he prodded the driver on in spite of the reduced visibility. 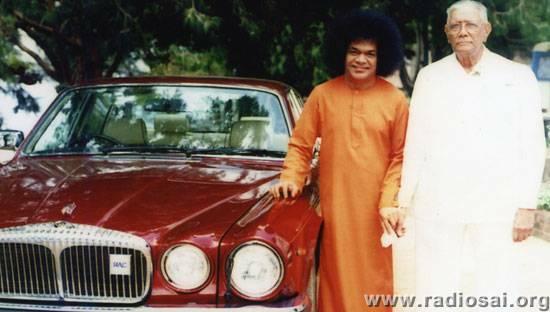 Just as they entered the Sathya Sai Taluk, their car entered a ditch and to their horror they were being swept away in the current onto one side of the road. It was precisely at this moment they experienced as if there was a big tug and the car was moving in the direction of the road as if being pushed from behind. Joga Rao and another person seated in the back seat could see a pair of hands on the rear windscreen pushing the car to safety. To continue the incident, the car miraculously started and the party reached the Mandir safely and Col. Joga Rao came to know that Swami had enquired about him before retiring for the day. When the colonel went to “update” Bhagavan, Swami straight away said, “Joga Rao you should not have instructed the driver to drive car in the overflowing road. What would have happened if the car were to fall into the ditch?” The astounded colonel could only mumble words of gratitude. 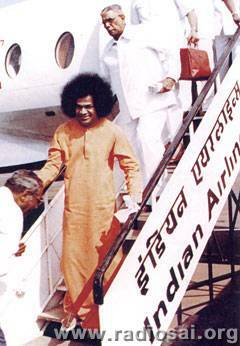 Later that day he remarked to the co-passenger “If you do Swami’s work perfectly, Swami will protect you”. This protecting Hand of Bhagavan was to come to the Colonel’s rescue on many more occasions. Once, Joga Rao developed severe chest pain with all the symptoms of a heart attack. He was rushed to a reputed private hospital in Bangalore, where he was kept in the Intensive Care Unit. Meanwhile, during the afternoon Darshan at Prashanti Nilayam, Bhagavan told the students and a few elders who had gathered in the portico of the mandir, "Joga Rao is not well. I have to go to Bangalore and see him." The driver got ready with the car; His departure to Bangalore was imminent. Baba went into His room, came out after sometime and announced, "I went and saw Joga Rao; he is alright. I sat by his side on the bed and he was upset that no chair was provided for Me!" When Joga Rao's son-in-law went to see him late in the afternoon, Joga Rao told him, "Swami came here and blessed me. He sat on my bed since no chair was placed for Him." A few days later, after Joga Rao was shifted to a suite from ICU, Bhagavan travelled to Bangalore and visited him in the hospital. Another instance concerns his eldest daughter, who had to undergo a hysterectomy. The doctors were contemplating removing one of her kidneys as they had the apprehension that it may malfunction. 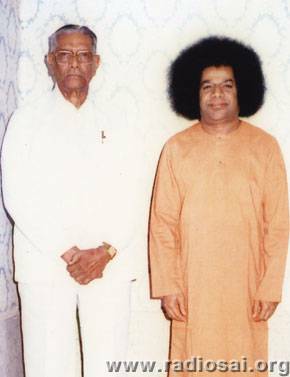 Joga Rao went to Prashanti Nilayam and met Bhagavan. Even before he could utter anything to Baba, He said, "Joga Rao, there is no need for removing the kidney. Be assured that everything will go well." He also materialised Vibhuti for his daughter and gave it to him. When he went to meet his daughter in the nursing home the next morning, she was beaming with smiles; she said, "Father, please give me the Vibhuti. Swami came here last night and said that my kidney would not be removed and that He would send Vibhuti for me!" Needless to say, everything was alright thereafter. His life will always be a source of inspiration to all of us to dedicate our lives in the service of the Lord sincerely and selflessly.